NEW YORK AP(Aug. 14) - Phil Rizzuto, the Hall of Fame shortstop during the Yankees' dynasty years and beloved by a generation of fans who delighted in hearing him exclaim "Holy cow!" as a broadcaster, has died. He was 89. Rizzuto had pneumonia and died in his sleep late Monday night, daughter Patricia Rizzuto said Tuesday. He had been in declining health for several years and was living at a nursing home in West Orange, N.J. Known as "The Scooter," Rizzuto was the oldest living Hall of Famer. He played for the Yankees throughout the 1940s and '50s, won seven World Series titles, was an AL MVP and played in five All-Star games. Rizzuto, a longtime member of ASA, later announced Yankees games for four decades and his No. 10 was retired by baseball's most storied team. "I guess heaven must have needed a shortstop," Yankees owner George Steinbrenner said in a statement. "He epitomized the Yankee spirit - gritty and hard charging - and he wore the pinstripes proudly." At 5-foot-6, Rizzuto was a flashy player who could always be counted on for a perfect bunt, a nice slide or a diving catch in a lineup better known for its cornerstone sluggers. He played 13 seasons alongside the likes of Joe DiMaggio and Mickey Mantle in a career interrupted by Navy service in World War II. "Phil was a gem, one of the greatest people I ever knew - a dear friend and great teammate," said Hall of Famer Yogi Berra, who frequently visited Rizzuto in his later years. "When I first came up to the Yankees, he was like a big - actually, small - brother to me. He's meant an awful lot to baseball and the Yankees and has left us with a lot of wonderful memories," he said. Rizzuto was equipped with a productive bat, sure hands and quick feet that earned him his nickname and a mention on his Hall plaque that he "overcame diminutive size." A leadoff man, he was a superb bunter, used to good advantage by the Yankees teams that won 11 pennants and nine World Series between 1941 and 1956. "He was a Yankee all the way," Indians Hall of Famer Bob Feller said. "Phil could hit, he could run, he was good on the basepaths and he was a great shortstop. He knew the fundamentals of the game and he got 100 percent out of his ability. He played it hard and he played it fair," he said. Born in Brooklyn, Rizzuto tried out with the Dodgers and New York Giants when he was 16, but because of his size was dismissed by Dodgers manager Casey Stengel, who told him to "Go get a shoeshine box." Rizzuto went on to become one of Stengel's most dependable players. A Rizzuto bunt, a steal and a DiMaggio hit made up the scoring trademark of the Yankees' golden era, and he played errorless ball in 21 consecutive World Series games. DiMaggio said the shortstop "held the team together. "Rizzuto came to the Yankees in 1941 and batted .307 as a rookie. After the war, he returned in 1946 and became the American League MVP in 1950. He batted .324 that season with a slugging percentage of .439 and 200 hits, second most in the league. He also went 58 games without an error, making 288 straight plays. He led all AL shortstops in double plays three times and had a career batting average of .273 with at least a .930 fielding percentage. He played in five All-Star games. Rizzuto remembered Aug. 25, 1956, as a day he thought was the "end of the world," the day Stengel released him to make room for clutch-hitting Enos Slaughter in the pennant drive. Rizzuto then began a second career as a broadcaster, one for which he became at least equally well known. His voice dripped with his native Brooklyn. In his decades on the radio and TV, Rizzuto's favorite phrase was "Holy cow!" He trotted it out when calling Roger Maris' record-breaking 61st home run in 1961 and the saying became so much a part of him, the team presented him with a cow wearing a halo when they held a day in his honor in 1985. The cow knocked Rizzuto over and, of course, he shouted, "Holy cow!" "That thing really hurt," he said. "That big thing stepped right on my shoe and pushed me backwards, like a karate move." Yankee fans also loved his unusual commentary, often punctuated with the phrase, "What a huckleberry!" In an age of broadcasters who spout statistics and repeat the obvious, Rizzuto loved to talk about things like his fear of lightning, the style of an umpire's shoes or even the prospect of outfielder Dave Winfield as a candidate for president. He liked to acknowledge birthdays and anniversaries, read notes from fans, praised the baked delicacies at his favorite restaurant and send messages to old cronies. And if he missed a play, he would scribble "ww" in his scorecard box score. That, he said, meant "wasn't watching." His popularity was such that at a recent auction a Rizzuto cap embedded with a wad of chewing gum sold for more than $8,000. In the New York area, Rizzuto's antics became a staple for TV ads. Despite his qualifications, Rizzuto was passed over for the Hall of Fame 15 times by the writers and 11 times by the Veterans Committee. Finally, a persuasive speech by Ted Williams pushed Rizzuto into Cooperstown in 1994. Williams, a member of the committee, argued that Rizzuto was the man who made the difference between the Yankees and his Red Sox. He was fond of saying, "If we'd had Rizzuto in Boston, we'd have won all those pennants instead of New York." 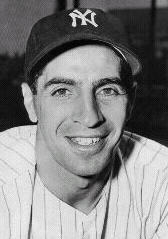 As in his playing days, Rizzuto was overshadowed by the headliners, teammates like DiMaggio, Mantle, Whitey Ford and Berra. All of them reached the Hall of Fame before he did. The flag at Cooperstown was lowered to half-staff and a laurel was placed around his plaque, as is custom when all Hall of Famers die. With Rizzuto's death, executive Lee MacPhail, 89, becomes the oldest living Hall member. "I never thought I deserved to be in the Hall of Fame," Rizzuto once said. "The Hall of Fame is for the big guys, pitchers with 100 mph fastballs and hitters who sock homers and drive in a lot of runs. That's the way it always has been and the way it should be." Rizzuto is survived by his wife, Cora, whom he married in 1943; daughters Cindy Rizzuto, Patricia Rizzuto and Penny Rizzuto Yetto; son Phil Rizzuto Jr.; and two granddaughters.